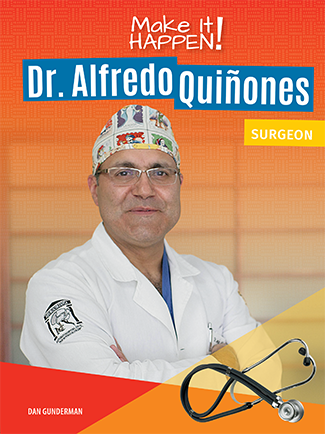 When Dr. Alfredo Quiñones-Hinojosa came to the United States as a teenager, he had nothing but $64 and a dream. With perseverance and confidence, he spent almost 20 years pursuing an education. Now he is a well-known brain surgeon and researcher. He helps save lives while also researching new ways to fight cancer. His life has been filled with struggles, triumphs, and mentors who helped him reach his goals. Dr. Q’s story will show young readers how they too, can Make It Happen! and achieve goals through support from their community and with a strong sense of self. The Make It Happen! series helps students build the skills necessary to reach their own goals. This series is not about learning how to become a superstar or hero. Instead, each book presents unique people who have overcome great challenges to succeed in work and life.